A St Agnes business which was forced to close earlier in the summer following an escape of water containing sewage which ruined the shop and all its stock, has officially re-opened after weeks of refurbishment work. Aggie Surf Shop in Peterville Square celebrated its re-launch with a reception for local businesses, customers and residents, during which the keys to the newly refurbished and re-designed shop were officially handed over to owner ‘Chops’ Lascelles by insurance repair construction company, Mulberry. 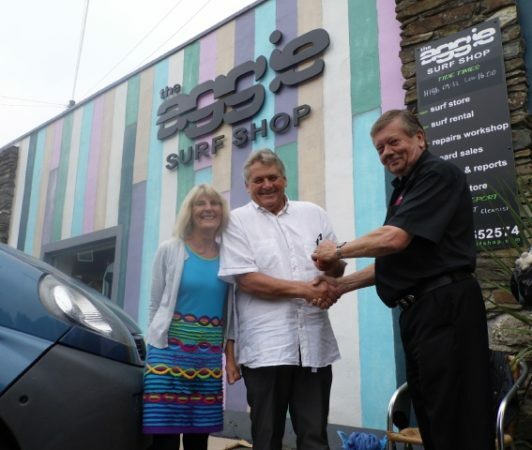 “I’m really delighted that we’re back and the Aggie Surf Shop is properly up and running again, as it’s been pretty tough since the incident which flooded us back in June,” said Chops, who has owned the business since 1984. The new look Aggie Surf Shop, which took five weeks to fit-out, is said to be bigger bigger and brighter. Martin Homan of Truro-based building firm, Mulberry, which handled the refit, explained: “We redesigned the internal layout to create additional shop floor space, as well as creating a new office and significantly improving the design of the stock room.